Engage. Tune in with your eyes and ears. Ask technical questions only after you have tried to answer them yourself, observing as closely as you can. Learning by example is a difficult art and one we tend not to practice much. We are often more comfortable being told what is happening than seeing it even when it is happening right in front of us. Asking what the instructor is making or what s/he is going to do next can be unhelpful—it is usually revealed in the immediate or very near future. If you need to, get up out of your seat to closely observe parts of the demonstrated pot. Note taking and quick sketching are good ways to stay engaged and also have a reference once the workshop is over. 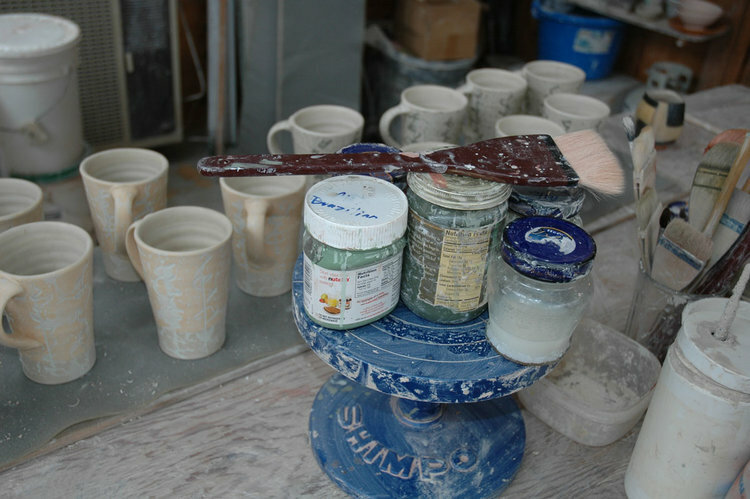 Don’t be afraid to attempt to reproduce the instructor’s pots. Doing so will help you to see more clearly the technical and aesthetic issues of those pots and should train you to have greater technical and aesthetic range in your own work. By attempting to reproduce pots other than our own (historical or contemporary), we gain a deeper understanding of form, line, clay-wall, detail—all things we see, but copying pots often shows us how little we really understood and trains us to see more. Make instructor’s pots in the spirit of an exercise, bearing in mind that the goal is to internalize and transform the instructor’s message into your own approach. This takes more time than any workshop offers. Also, try do not be frustrated by the difficulty of new technical challenges. You will have time to work on techniques in the weeks and months that follow. Try not to be competitive. Often during the first couple of days, too much energy is expended on anxiety about where each student is in relation to the others. Everyone, including the instructor, has come to engage in the painful and glorious process of pushing our work forward, regardless of where we start. Generosity and support not only make a more pleasant experience but are the magic yeasts that leaven the dough for all to rise. Engage the instructor to talk about the questions that you are struggling with. No instructor can cover his or her whole knowledge base in the time of a workshop or guess the particular concerns of students. If it’s kiln design or photography you need help with, ask. The instructor may or may not be knowledgeable—or feel it’s possible to cover it in the particular workshop—but it incumbent on you to speak up. Be as informed as you can. Read: There is a wonderful body of writing about our field from Leach’s and Cardew’s foundation texts to Clary Ilian’s inspiring Potters’ Workbook, with many stops in between. The magazines, especially back issues of Studio Potter, were essential in my own education. And look: there are incredible collections of historical pottery in many museums, all of which may not be on display, but may be accessible if you make an appointment. Solutions to the problems that we are working on—how a cup’s lip delivers its liquid to the mouth, how a pattern divides a bowl—have been researched and elaborated by human beings for over 5,000 years. You can go to the museum and see some great solutions in an afternoon, or figure them out yourself in your own studio, if you have a long, long time. Cardew, Michael. Pioneer Pottery. New York: St. Martin’s Press, 1969. Davis, Harry. The Potter’s Alternative. Radnor, PA: Chilton Book Company, 1986. Illian, Clary. A Potter’s Workbook. Iowa City: University of Iowa, 1999. Leach, Bernard. A Potter’s Book. Leach, Bernard. The Potter’s Challenge. New York: Dutton, 1975. Sweezy, Nancy. Raised in Clay: The Southern Pottery Tradition. Washington, DC: The Smithsonian Institution Press, 1984. Watkins, Laura. Early New England Potters and Their Wares. Wilson, Richard L. The Art of Ogata Kenzan: Persona and Production in Japanese Ceramics. New York: Weatherhill, 1991. Zug, Charles G. Turners and Burners: The Folk Potters of North Carolina. Chapel Hill: The University of North Carolina Press, 1986. Hamer, Frank and Janet. The Potter’s Dictionary of Materials and Techniques. Third Edition. London: AC Black. 1993.